Last month, Neil handed me a 90 Rupee copy of One Straw Revolution from India and said, "This is the story of a Japanese farmer. You'll really like it. It's about farming, but not really." Very seldom will I hold a book and feel, "Pay attention to this." One Straw Revolution was one of those. For thirty years I lived only in my farming and had little contact with people outside my own community. During those years I was heading in a straight line toward a "do nothing" agricultural method. The usual way to go about developing a method is to ask, "How about trying this?" or "How about trying that?" bringing in a variety of techniques one upon the other. This is modern agriculture and it only results in making the farmer busier. My way was opposite. I was aiming at a pleasant, natural way of farming which results in making the work easier instead of harder. "How about not doing this? How about not doing that?" -- that was my way of thinking. I ultimately reached the conclusion that there was no need to plow, no need to apply fertilizer, no need to make compost, no need to use insecticide. When you get right down to it, there are few agricultural practices that are really necessary. The reason that man's improved techniques seem to be necessary is that the natural balance has been so badly upset beforehand by those same techniques, that the land has become dependent on them. This line of reasoning not only applies to agriculture, but to other aspects of human society as well. Doctors and medicine become necessary when people create a sickly environment. Formal schooling has no intrinsic value, but becomes necessary when humanity creates a condition in which one must become "educated" to get along. Before the end of the war, when I went up to the citrus orchard to practice what I then thought was natural farming, I did no pruning and left the orchard to itself. The branches became tangled, the trees were attacked by insects and almost two acres of mandarin orange trees withered and died. From that time on, the question, "What is the natural pattern?" was always in my mind. In the process of arriving at the answer, I wiped out another 400 acres. Finally I felt I could say with certainty: "This is the natural pattern." To the extent that trees deviate from their natural form, pruning and insect extermination become necessary; to the extent that human society separates itself from a life close to nature, schooling becomes necessary. In nature, formal schooling has no function. In raising children, many parents make the same mistake I made in the orchard at first. For example, teaching music to children is as unnecessary as pruning orchard trees. A child's ear catches the music. The murmuring of a stream, the sound of frogs croaking by the riverbank, the rustling of leaves in the forest, all these natural sounds are music -- true music. But when a variety of disturbing noises enter and confuse the ear, the child's pure, direct appreciation of music degenerates. If left to continue along that path, the child will be unable to hear the call of the bird or the sounds of the wind as songs. That is why music is thought to be beneficial to the child's development. The child who is raised with an ear pure and clear may not be able to play the popular tunes on the violin or the piano, but I do not think this has anything to do with the ability to hear true music or to sing. It is when the heart is filled with song that the child can be said to be musically gifted. Almost everyone thinks that "nature" is a good thing, but few can grasp the difference between natural and unnatural. If a single new bud is snipped off a fruit tree with a pair of scissors, that may bring about disorder which cannot be undone. When growing according to natural form, branches spread alternately from the trunk and the leaves receive sunlight uniformly. If this sequence is disrupted the branches come into conflict, lie one upon another and become tangled, and the leaves wither in the places where the sun cannot penetrate. Insect damage develops. If the tree is not pruned the following year more withered branches will appear. It it the same way with the scientist. He pores over books night and day, straining his eyes and becoming nearsighted, and if you wonder what on earth he has been working on all the time -- it is to become the inventor of eyeglasses to correct nearsightedness. There's great wisdom here--thank you Nipun for bringing One Straw Revolution to our attention. Where can we get a copy?? A friend of mine gave me his feedback regarding this post:" How is my daughter supposed to learn how to play the piano if I don't teach her? The discussion also makes a lot of assumptions about what is natural...is everything to be judged by how far removed it is from some supposed "state of nature"? What "music" was I, as a child, "naturally" attuned to? Western music? I do agree that we tend to create new problems when solving others, or that we deliberately create problems in order to sell solutions to them, and that the idea of material progress is inherently unsustainable; but to respond by promoting some sort of monastic abandonment of any man-made improvement to the human condition isn't realistic either -- except as maybe a basis for individuals, not for society as a whole. In my opinion." Great post! We are actually practicing this method in our tea garden, which is in the northing region of Tetulia, Bangladesh. We have a blog[View Link] in which I'll be documenting these methods while I'm here. i am impressed by his philosophy and that too just by reading this blogpost. @jean yao what the post meant by music was 'melodious sound'. where else but inspired by nature were the first notes produced by man? This chapter gives a glimpse of the genesis of Fukuoka's thinking. More study is necessary to understand the experimental nature of his life. He spoke of do-nothing farming, but he didn't himself do-nothing. He deliberately made clay balls so birds would not eat seeds before they germinated. He put rice straw back on the land in a deliberately random way so the new crops could come up through. 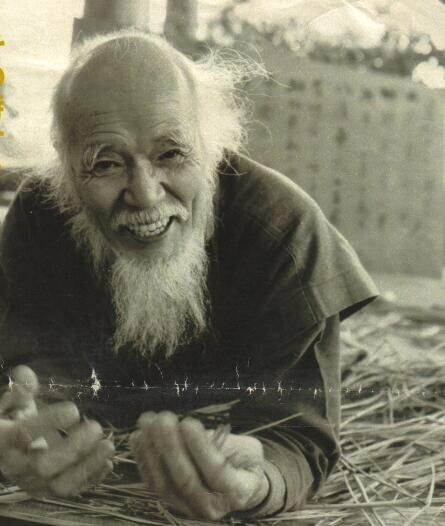 He spread daikon seeds wanting daikon's strong roots to till and to add biomass. He used legumes carefully, including tree legumes. Sometimes he would bury logs of tree legumes to add nitrogen above the nitrogen they added while alive. I think he was wanting humans to have a humble view of themselves and of their interventions. He wanted us to carefully look at consequences of our practices. Some American tribes see God as a first necessity because without a sense of God, some people will not eat or come in out of the cold. Indeed, in Western culture, anorexia can be one of the most difficult maladies to treat. My sense is that Fukuoka wanted humans to get a sense of accomplishment in caring for themselves and others, but he wanted our accomplishments to be as a reasonable and constructive part of nature. I think where you wrote "To the extent that trees deviate from their natural form, pruning and insect extermination become unncessary" you meant to write "necessary." For more great taoist writing on this subject from 2000 years ago, see Chuang Tzu: The Inner Chapters by AC Graham. can any one tell me where i can buy fukuoka books in india. i am in bangalore . As another wise one said 'the superior man rests in simplicity'. As a naturopath I would say many health problems are caused by complicated diets, complicated lives, all very far removed from what was once natural living. Most therapy involves redirecting people towards simple healthy foods, getting adequate rest, sunshine and fresh air. Only 10% of people in the western world do even 30 minutes exercise a day, is it any wonder we get stiff and overweight. My advice is start the day with exercise,breathe use your body as best you can, eat foods in the form they grow, spend time with friends and family. Such a day will be looked back on with joy.